Color Touch finish is a dyeing finish achieved with the DyeMansion technology and most specifically with the DM 60 dyeing machine. This finish gives your 3D printed parts a satin look so that they look like finished products. Thanks to the post-printing treatment procedure we follow before applying the Color Touch finish on your 3D parts, they get resistant enough to be exposed to external conditions, they resist scratching and rubbing. Moreover, you get a very stable and consistent color between different production batches, which is great if you need to produce an important amount of identical parts. The surface shows a uniform color, with a very good quality. 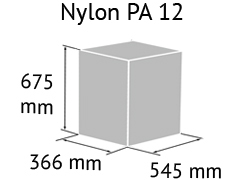 If your 3D printed white Nylon PA12 parts are meant to be exposed to external conditions for an extensive period of time, we recommend you to dye them with this finish so as to avoid the unwanted “yellowing” color alteration. Thanks to the Color Touch finish, your 3D printed parts become high quality finished products, with great longevity. Parts that are colored with DyeMansion technology are skin-safe. In addition, the dye stuff and the additives allow us to achieve a high UV-resistance. Some of our customers’ colored products like 3D printed glasses have been used daily for more than two years and their colors are still UV-stable and brilliant. At Sculpteo online 3D printing service , you can apply the dyeing Color Touch finish on HP Multijet Fusion technology PA12 3D printed parts and on white Nylon PA12 3D printed plastic parts. DyeMansion is a Germany-based company that offers a variety of high-volume finishing systems for an easy ‘Print-to-Product’ workflow that transforms raw 3D-printed parts into high-value consumer and industrial products. With the ability to provide precision coloring and finish to the most exact specifications, the DyeMansion technology is already trusted by more than four-hundred customers, including leading global manufacturers in diverse industries, such as eyewear, automotive, retail, medical, and sports equipment. DyeMansion has quickly established itself as the global leader in additive manufacturing finishing systems, as it delivers high-volume production for anything from luxury sunglasses to mission-critical automotive parts. Submerged in a water bath, the dye penetrates the plastic through a chemical reaction under pressure and heat. The penetration depth is typically 0.2 mm and can even be increased using our intensive color solution. No material is added and every surface is reached in the water bath. Keep in mind that the final appearance and color availability is determined by your raw material. Meaning that white parts (coming from SLS technology) allow for the whole color spectrum and build the base for our unique color database. On the other hand Grey parts (coming from HP Multi Jet Fusion technology) are more limited on darkish tones . Through our ordering platform , the available colors of the Color Touch finish you can apply on your Nylon PA 12 parts are: blue, black, red, green and orange. Though, if you want any of the following colors, you can contact our Sales Team for customizing your order: yellow, brown, pink, white, violet, navy, bordeaux, antracite and stone gray. The only color of the Color Touch finish you can apply on your HP Multijet Fusion parts is black. The maximum size for dyeing your models with the Color Touch finish is limited by the physical size of the dyeing tank of the DM 60 machine. Your designs must respect this maximum size in order to be dyed with Color Touch finish. There is no minimum size for dyeing with Color Touch finish. Standard production: minimum 5 to 7 days on average. The DyeMansion coloring solution is compatible with parts of every geometry. Even very filigrane or complex parts get through the coloring process without any problems. Submerged in a water bath, the dyestuff penetrates the plastic through a chemical reaction under pressure and heat. In this way the dye reaches spots that cannot be colored homogeneously with painting. Due to the chemical reaction that occurs between dye and material, the parts retain their geometric properties. We advise you though, to avoid hollowing your 3D printed parts, as they might float inside the tank and not be colored homogeneously. In addition, engraved parts with small depth of carving are likely to get filled with ceramic powder during the procedure of sandblasting that the parts go through. If an engraving is an essential part of your design we recommend making them as deep as possible so that they will be able to be cleaned out. To ensure a better powder removal (thus a better detail visibility), the width of your details must be at least as big as deep. Color Touch finish is a great choice to give a satin look to your 3D printed plastic parts. The surface gets shiny and bright enough to be elegant. Thus, Color Touch finish is ideal to be applied on products that need a smooth colored surface, such as eyewear, fashion products, items from jewelry industry etc.. At the same time your objects are skin-safe, UV resistant and resist daily handling. In addition, you can apply Color Touch finish to products that need to have a color finish which remains stable over time. In the pictures below, you can see the differences between surfaces of two 3D printed plastic parts: the first one with Color Touch finish, and the other one raw.